I had a really great month for running. The best part is that I felt strong this month, and that makes for some happy running. I was rotten, though, and did absolutely no crosstraining. Again. So total mileage this month was 130 miles. I did one race - the half marathon in Danville. My longest run was 13.1 miles. I hit the track 3 Saturdays, and my track workouts seem to be going much more smoothly than previously. I think that may actually be the result of cooler temperatures, but part of me hopes it means I'm getting stronger and faster. I've being doing combinations of quarters, miles, and an odd 800 here and there when at the track. Hey, I know! Let's just pretend I'm getting faster and it has nothing to do with cooler temps, okay? Denial can be a good thing, right? So my months have gotten progressively heavier on the mileage this fall, mostly in an attempt to try to make up the ground that was lost last winter and spring when I couldn't run due to my injury. I'm happy to report I've caught up, and now I get to have a cut-back month in December, which is probably overdue. With the holidays, December is a good time to cut back a little on mileage, and I tend to do so every year. I need to get in 95 miles this month to meet my year end goal. Barring injury or illness, I should be able to do this, which would make me very happy. Particularly since I didn't meet my year goal to run a marathon in 2011. Do you have any end of the year goals to see out 2011? Please go enter my giveaway to win 3 products from Eco Natural Soaps here! Way to go, Lisa! So glad you are feeling so strong. 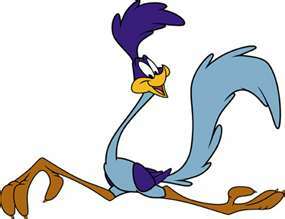 Well done or regaining your mileage quota Roadrunner! Congrats! 130 miles and a half marathon is impressive! Enjoy your cut back month. December is a good month for that with the flurry of activities and extra eating! Good luck on reaching this months goal! Wow! You are doing great! No end of the year goals here,lol! You ran through the last month with full steam! Congrats! Nice work Lisa. Cold weather running requires grit--something I admit that I lack. Glad you are courageous. Your mileage goals are stunning. I am SO impressed at your dedication. Wooo! Good for you - glad you are feeling stronger! When I saw the roadrunner in the reader, I had to laugh and was wondering what the boys were up to now! LOL. So happy you are becoming stronger and fulfilling your goals. Get some rest when you can! I am so impressed! Way to go! Wow, you are amazing! Your follow-through and strength is very inspiring!! My only goal to see out 2011 is to keep my sanity in tact. That's it. Plain and simple. glad to hear that you're getting stronger and feeling better. I wish I could run again, just once, and feel the wind rushing past me and the burn in the lungs, the little stitch in the side, be really thirsty and tired in a good way. You GO, girl!!! A goal, gosh, I have never thought about that, we are so busy all the time, it is hard just keeping up and finding the time for things. One goal I try to do is just be kind to people no matter what they say or do, and not speak my mind, but be quiet and wait. To think twice. Because I naturally tend to be quick in talking and impulsive. Did I thank you for the pizza sauce recipe??? Thanks SO much, this is a Christmas gift to ME!!! And I never would have thought of using those ingredients, I can't wait to try it! You've done good girl! That's nothin' to sneeze about and would put the rest of us to shame! God bless ya and you go girl!!! To think of 95 miles in less than a month sounds so intimidating to me, but I'm not a runner. You're doing great! Wow you put my little workouts on the treadmill to shame! I finally ran five minutes straight the other day and was so proud--usually I walk! You go girl!!! Great month sweetie! You're doing amazing!!! 130 miles! Wow!! Another congratulations are in order. You are just amazing!!! I can't believe all the miles you run, you are like Forrest Gump. Run Lisa Run!!! I'm beyond impressed. I have been fairly consistent with getting to the gym and I've cut out sugar. I've been feeling a lot better. Wow! I don't even like to drive that far let along run it! Well done!